Your favorite Star Wars starships have been reimagined as Hot Wheels die-cast cars for optimal speed and maximum performance! "Carships" capture the attributes of iconic starships, while accelerating to lightspeed on a Hot Wheels track. 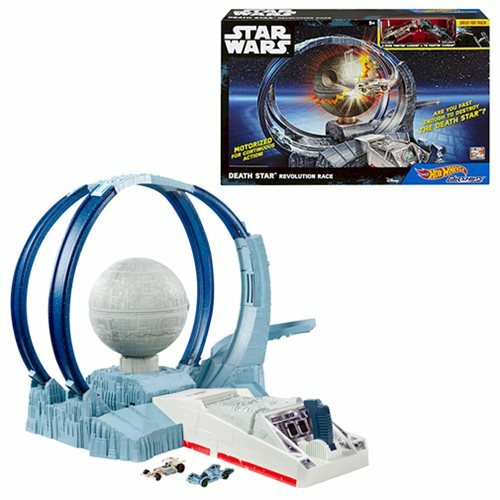 Now it's up to you to take down the enemy base with the Hot Wheels Star Wars Death Star Revolution Race track set. Inspired by one of the most iconic scenes from the Star Wars universe, the set features the Death Star at the center of a web of intertwining track that allows Carships to simulate flight! Kids can launch Carships one at a time into the set using a joystick launcher that thrusts the vehicles into a circular flight pattern around the Death Star with dizzying speed and occasional collisions. Time it right and the Death Star will explode. This motorized, boosted set includes 2x Carships, the X-wing Carship and TIE Fighter Carship. Requires 4x "D" batteries (not included). Ages 5 and up.